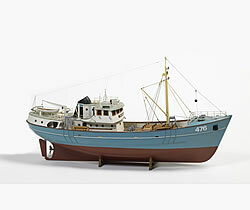 Billings Boats BIL476 Nordkap-North Sea Trawler 1/50 scale wood ship kit! A typical trawler from the North Sea, built in1970 at an English shipyard. The model kit isbased on the original ship drawings. Tonna-ge: 185 gross register tonnage – Length ove-rall: 40.0 m – Beam: 9.30 m – Motor: 1000 HPdiesel – Engine speed: 12-14 knots – Crew: 7-8 men – Fishing tackle: Drag net (trawl) – Fis-hing area: Around Iceland and Greenland –Haul: Herrings, cod and trash fish.